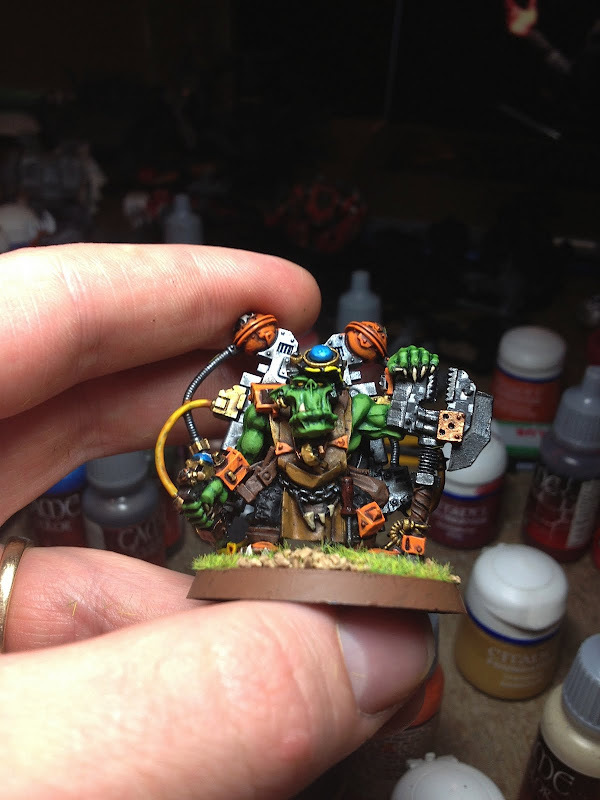 Recruits for the waagh - Ten more flash gitz! What may be my new favorite models! They are adorable and took only about an hour and a half each. He is incomplete. I need to finish his base and his forge world crewmen, but his body is 95% complete. Need to weather him a little more and finish the paint chipping. I need to repaint the little bobble on the side of the mek gunner's head. It will be blue. First 5 kustom flash gitz! These were made with parts from a dozen sources. Bodies are old pewter nob torsos. 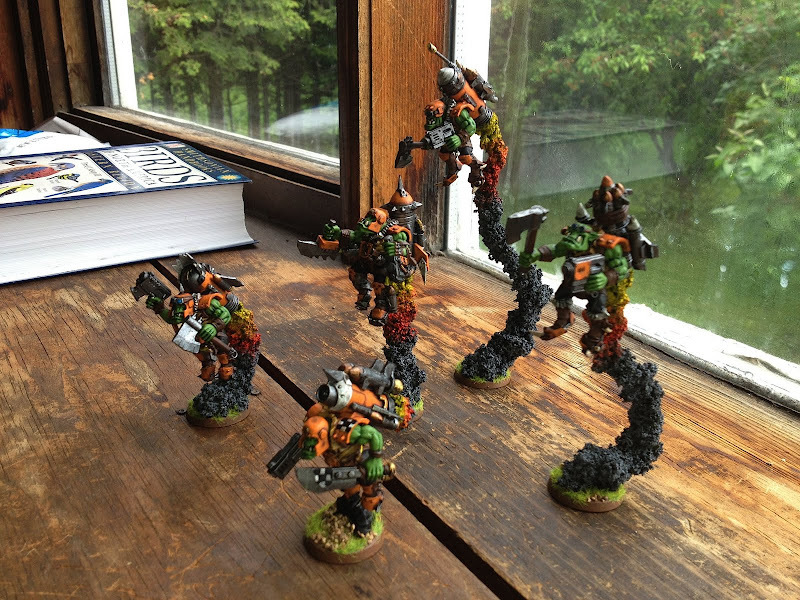 The guns and arms are from the nob kits, rokkit arms from shoota boyz, neuron and fish'ead bits, flagellant banners, black ork arms and heads, and many more. Skull head and sweet dakkagun! Targeter monocle with Deathmark sniper rifle shoota! fish'ead repeater with scrap of robes from a Dawn Bringer vet to rub in the awesome. 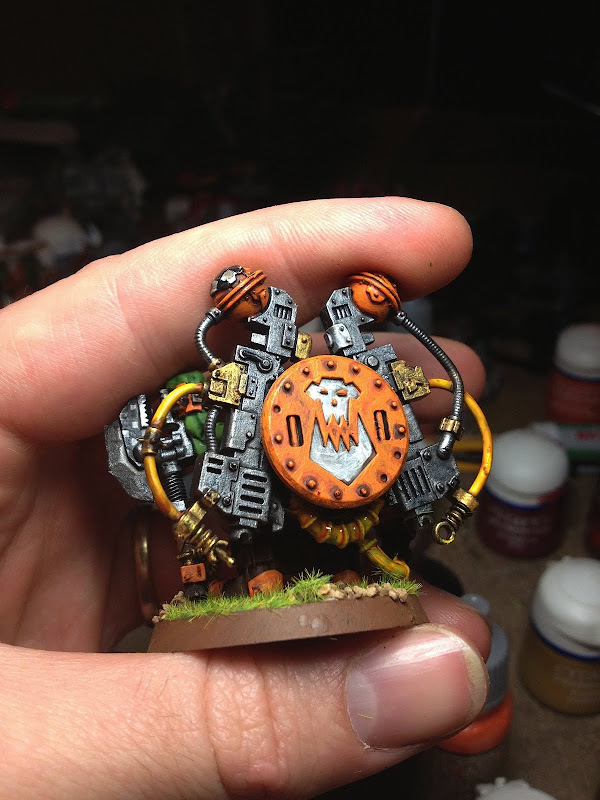 The big mek selfmade KFF is really nice! 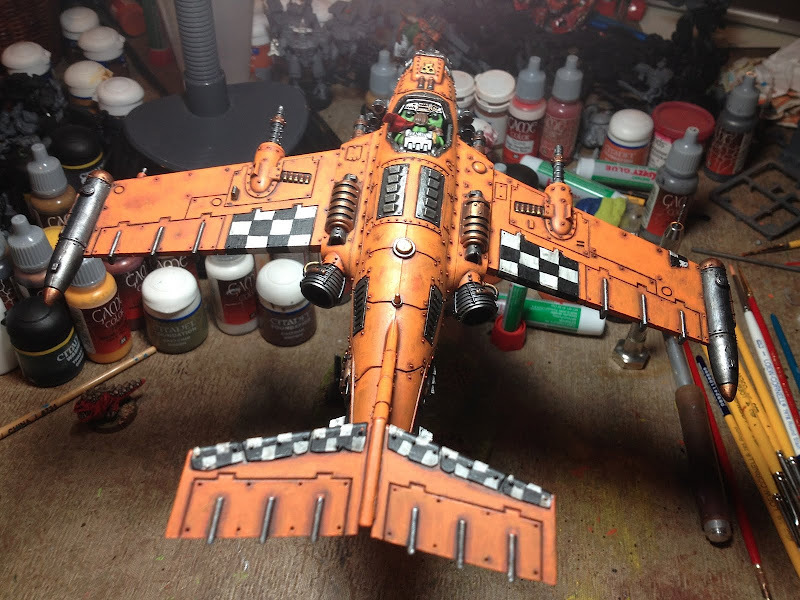 But the grot tanks are the best: soo cute!!! That's a nice looking army! 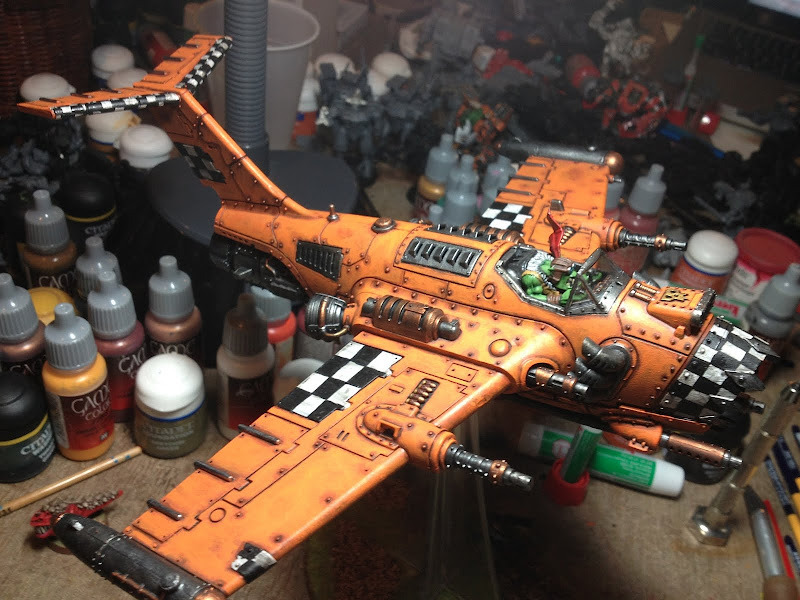 Normally I'm not a fan of orange armour on orks, but you've even pulled that off with that "dirty" orange. That light blue works well as a spot colour, you should put some on all models. 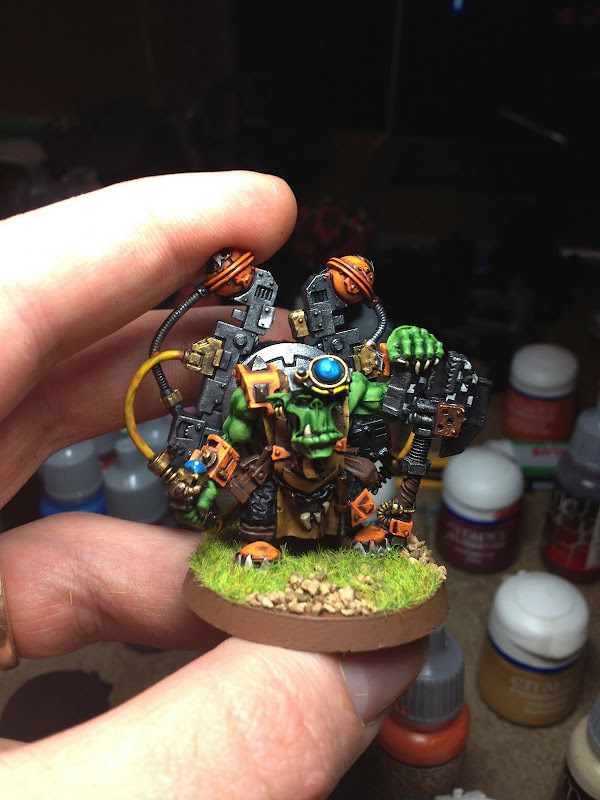 Funilly enough, I started yesterday to paint my converted Big Mek with KFF, and he has the same KMB-bitz as your Mek - well, great minds etc. I have beakie shoulders and plates scattered across the army. 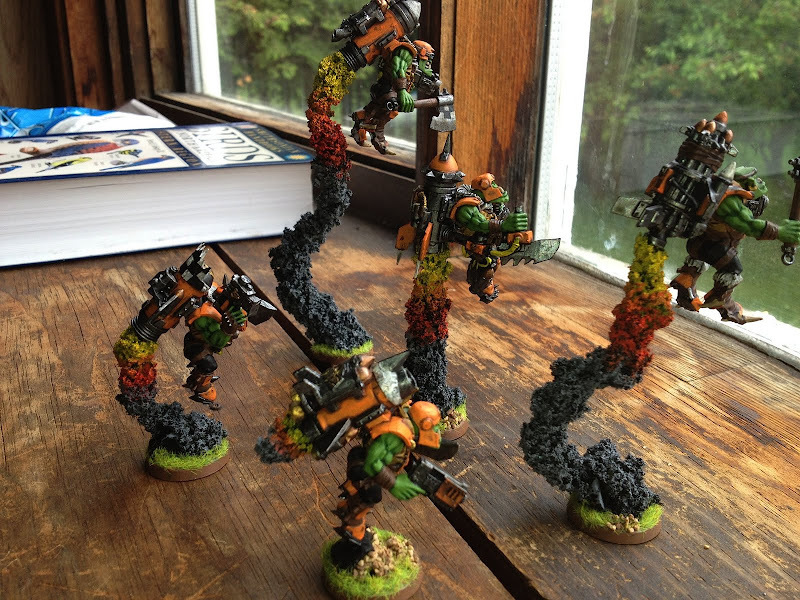 Really nice job on the Stormboyz. Must've taken a fair bit of work to get them properly balanced. 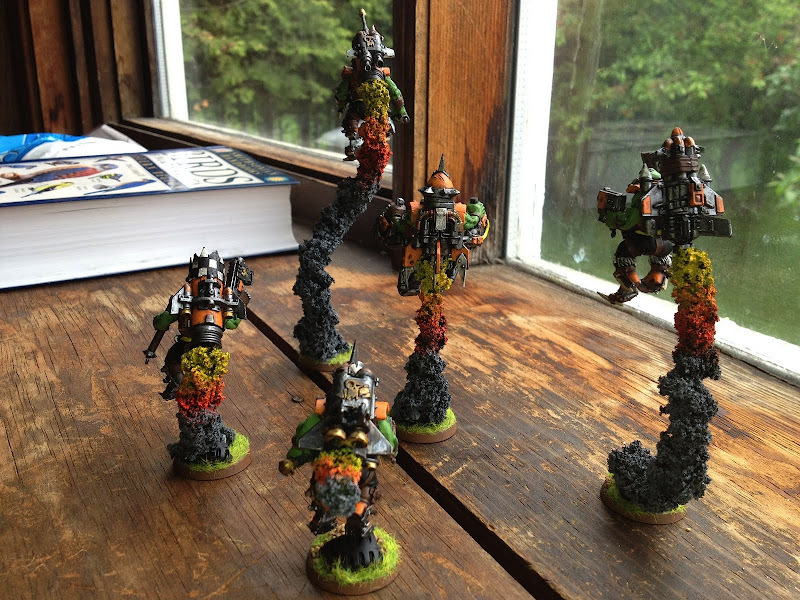 Here is how I deploy my stormboyz. I made a tray and attached high strength magnets to it. 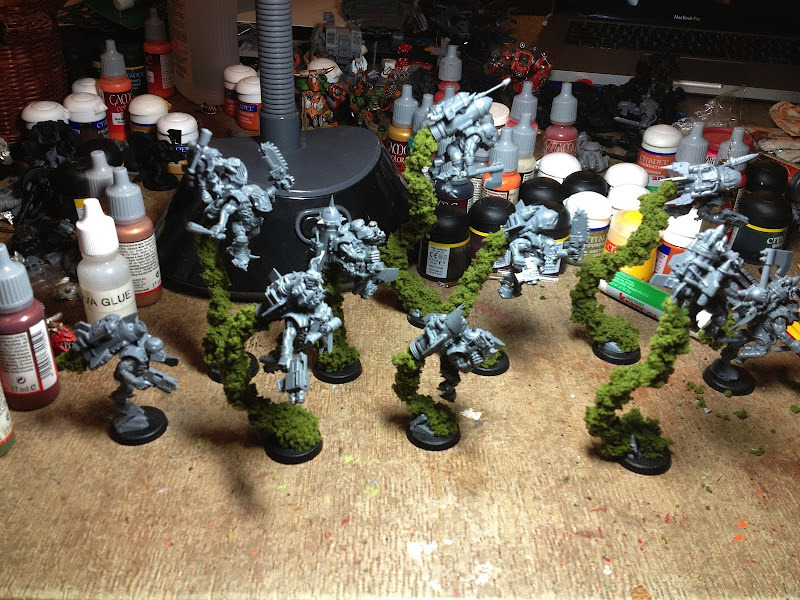 I then placed steel washers on the bases which allows me to move them around without them falling everywhere. 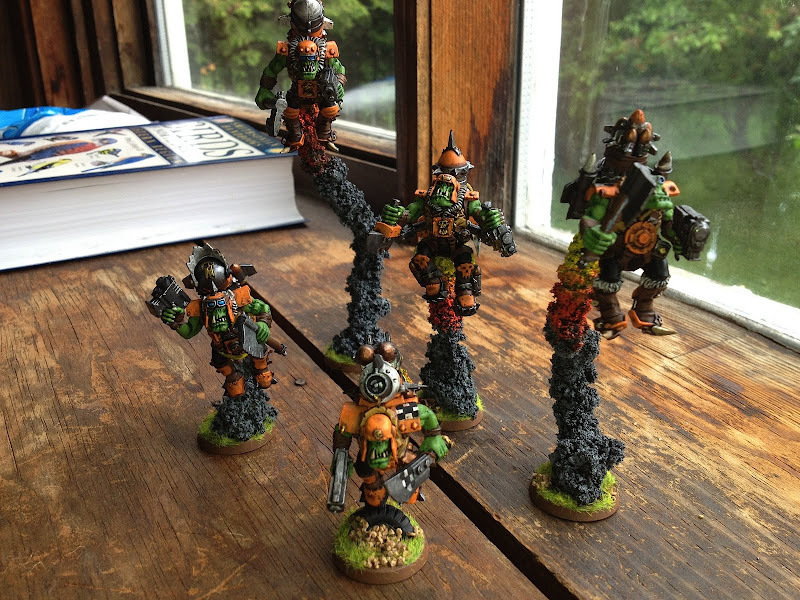 They are super tipy without them, but so are the normal stormboyz! There are some wonderfully plunderable ideas to be had from your boys for sure. Also thanks for the perspective on how you make those stormboys work. 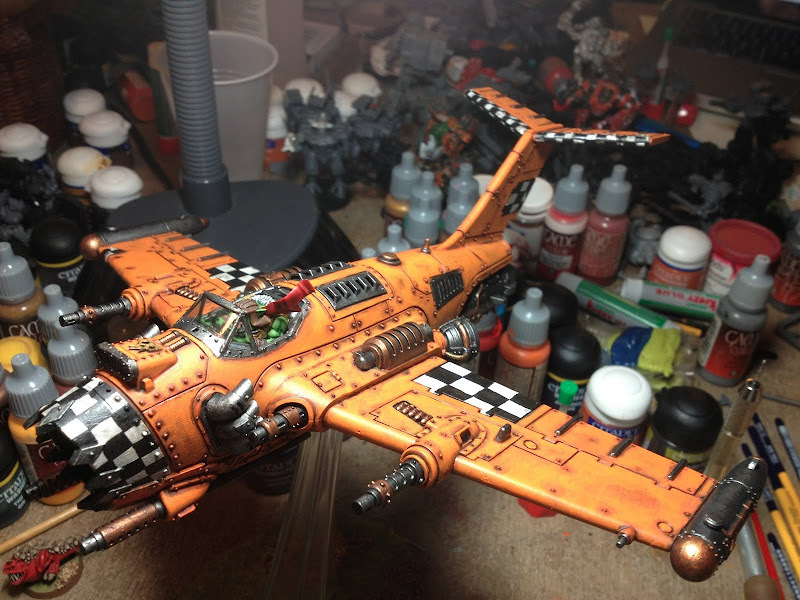 Have you shared your orange paint process around somewhere? I like the look of it. is that a kff mek? nice use of kmbs eitherway. 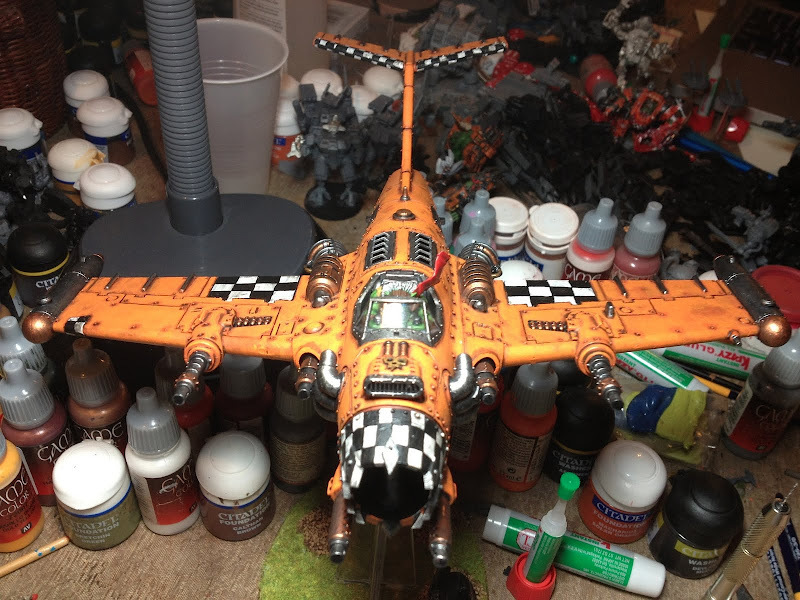 Also, epic flash gitz! All done the Morkanaut! 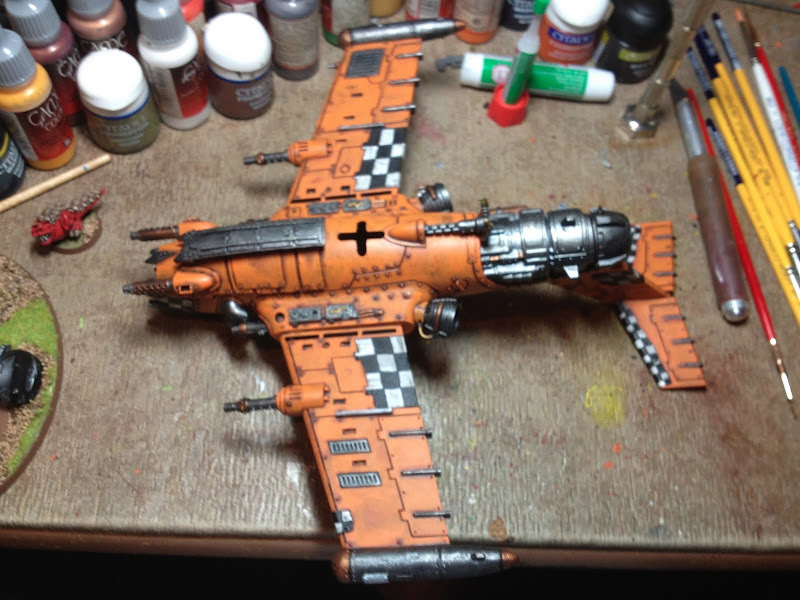 Based and weathered. Might need a couple touch ups here and there but as a whole it is a wrap! Morkanaut is by far the best of the pair now that he is the only way to stick a KFF out there and have a bubble! Two sunny shots with a ground level perspective. Out of the sun, it is a little easier to see the details. Detail looks at the various belly decorations.